Vice-President and Judge of the International Court of Justice (1991-2000). 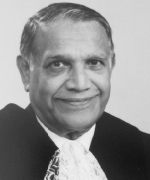 Judge Weeramantry was born in Ceylon (Sri Lanka) in 1926. He was admitted to the Bar at the age of 21 and practised as a lawyer for seventeen years. He was appointed a Judge of the Supreme Court of Ceylon at the age of 41, and served in that capacity for five years. In 1972, he accepted the Sir Hayden Starke Chair of Law at Monash University, Melbourne, and occupied it until his election as a Judge of the International Court of Justice in 1991. From 1997-2000, he was Vice-President of that Court. His dissenting opinion on the Legality of the Threat or Use of Nuclear Weapons, in which he adopted the position that state sovereignty is limited by international law, has been described as 'the most far reaching legal analysis ever written on the laws of war and the use of nuclear weapons'. Of his contribution to the Court, especially through numerous dissenting opinions, a commentator has written: 'Judge Weeramantry enormously expands the range of international law and the sources from which it may draw. He extends international law geographically, by his insistence on studying the civilizations of Africa, Asia, and the Pacific as sources of law; and he extends it temporally by connecting international law with the religious and customary norms adopted by societies which existed centuries ago. In all these different ways, he has sought to enrich the comprehensiveness, coherence, and legitimacy of international law' (Anghie, 14 LIJL 829). Judge Weeramantry was the Chairman of the Independent Commission of Inquiry established by the Government of Nauru in 1987 to examine the question of responsibility under international law for the rehabilitation of the phosphate lands of Nauru mined-out during international trusteeship. He is the Founder-Chairman of the Weeramantry Centre for Peace Education; President of the International Association of Lawyers against Nuclear Arms; and Patron of the McGill University Centre for International Sustainable Development Law. He is a Member of the International Academy of Comparative Law, Paris; Institute of International Law, Paris; and the World Future Council, Hamburg. Honours received by him include the Order of Australia for services to the law; UNESCO Peace Education Laureate 2006, and the Right Livelihood Award 2007. In 2007, he received the Sri Lanka Abhimanaya, the highest national award of Sri Lanka. He is a Doctor of Laws of the University of London, and has been conferred honorary doctorates by the Universities of London (D.Lit), Colombo, Monash, and the National Law School of India (LL.D). He has published over 23 books (including Justice Without Frontiers; Lord's Prayer: Bridge to a Better World; Islamic Jurisprudence: Some International Perspectives; and The Slumbering Sentinels: Law and Human Rights in the Wake of Technology) and 200 articles on peace, human rights and law, and made presentations in over 45 countries. Copyright © JIG. All Rights Reserved.